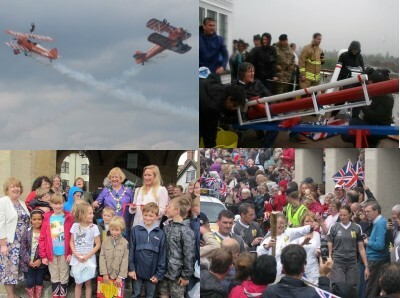 2012: Diamond Jubilee, Olympics and flooding. 2013: Here We Come! On Jan 1st the Town Crier kindly posed with the boots and sack as we walked round the 1556 Abingdon boundary. February did celebrate Valentine’s Day but most people were already looking forward to the olympics. 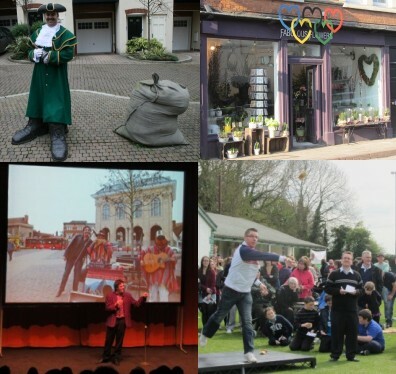 March brought Mark Steele to town as part of the Abingdon Arts Festival. In April people competed to see who could throw a bun the furthest and help the councillors during the diamond jubilee bun throw. In May was the amazing Abingdon Air and Country Show. In June was the Diamond Jubilee celebrations, and James May came with various contraptions to help councillors throw buns. It poured with rain but we showed Dunkirk Spirit. In July Abingdon Museum was re-opened, and the Olympic Torch was carried through Abingdon. 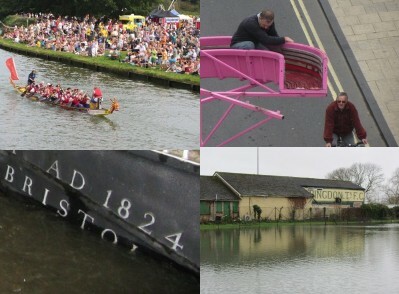 In September the postponed Dragon Boat Racing took place – postponed because the river was flooded earlier in the year. The year started with a drought and hose pipe ban. October brought the Ock Street Fair. 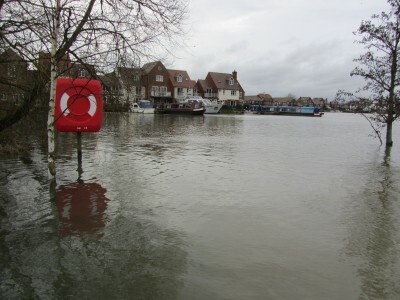 November brought floods, and December brought yet more floods. 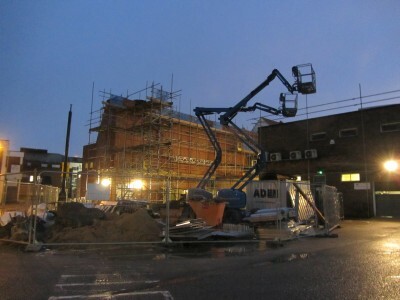 Throughout the year contractors have been working on the Abbey Shopping Centre. 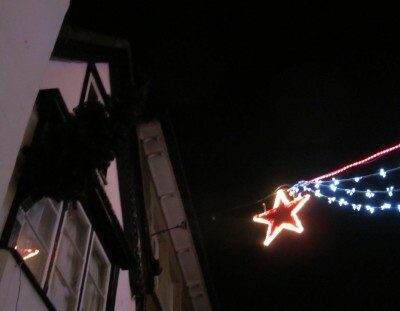 Their super human efforts will hopefully mean a Happy New Year for Abingdon with shops like M&S and Debenhams queuing up to be part of this wonderful town. 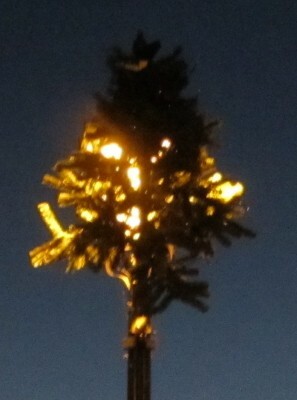 The new solar powered Christmas trees have not been a shining success during their first Christmas in Abingdon. I have seen a blue flicker from some of the trees positioned, next to far brighter street lights, on Abingdon Bridge, but don’t know if it is the sun or the streetlight giving them the energy for their faint flickerings. Some other trees have not managed a flicker, that I have noticed, but then the sun has been like a stranger to us this Christmas. Lets hope things change before twelfth night. Press on Changes in 2012 for a bigger pdf version. Not a brilliant map and not to scale but it serves this yearly purpose. Goodbye to: Thai Orchid Restaurant and Supermarket, The Florist and Bistro in Bath Street, The Snack Kiosk, the Toy Shop nearby, and Lemon Plaice in the shopping centre. YMCA also moved out but their building was knocked down so did not count – nor did the Calendar Shop. Welcome to Buns in the Basement, Galaxy Techno, The New Nags Head, OX14 Deli, Qutis, and YbuYnu.. The man running Abindon Bowls retired, and so Outdoor Traders moved back in there creating a second outlet. A-Plan also moved to a larger premises, and are looking to Let their previous premises. So really not such a bad year for Abingdon given the disruption caused by the redevelopment of the Abbey Shopping Centre. Let me know if I forgot anything important. 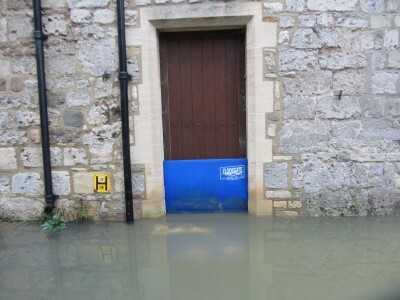 The level of the flood water has remained high over the last 48 hours, and the blue floodgate by St Helen’s Wharf is still needed. I don’t think either river got quite as high as last month but the spread of water over the flood plain is less predictable. Water continues to pour under Maud Hale’s Bridge, and any other opening. 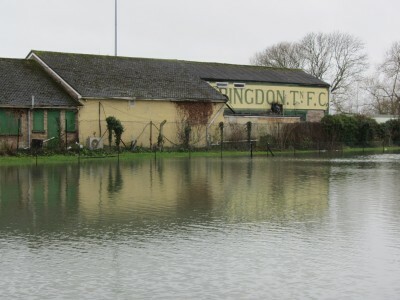 Tomorrow’s match at Abingdon Town F.C has been called off as the pitch is under a foot or more of water. 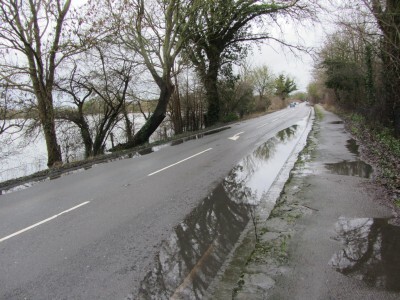 The causeway to Culham has water on both sides. 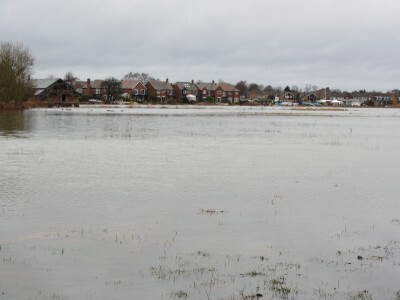 There is a watery view back across the fields from the causeway to Abingdon School boathouse, the Marina, and Wilsham Road. 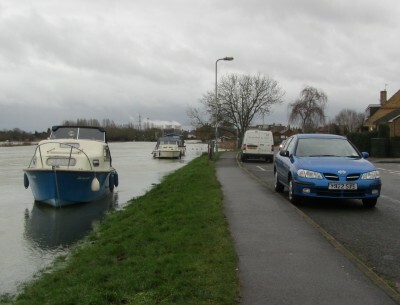 Along Wilsham Road there is still some way to go before the boats are at the same level as the cars. But nobody is risking their car at the Marina car park at present. Water continues to pour through the gate with some force. 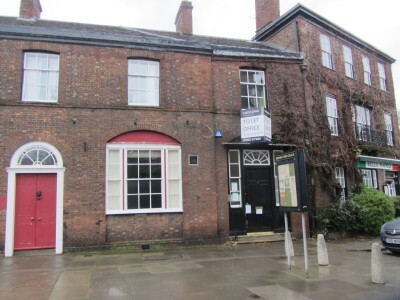 Six new apartments are on the market in Stert Street which were until recently vacant offices. 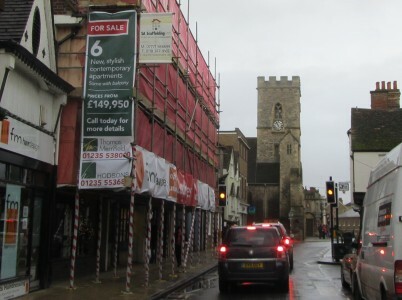 2012 saw an increase in the number of applications to change offices in Abingdon town centre to residential use. 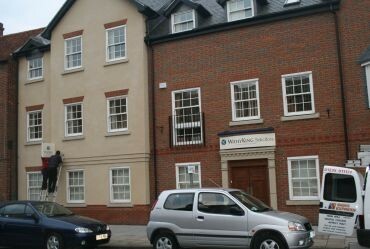 In July 2012 plans were submitted to convert ground floor offices in Lombard Street to form 2 one bedroom and 1 two bedroom apartments. 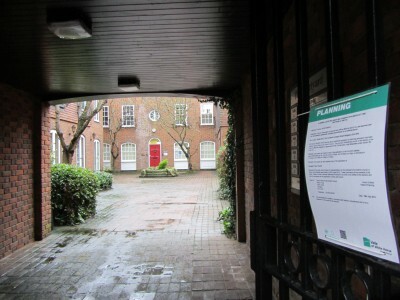 October 2012 – West St Helen Street – plans submitted for change of use of building from offices to residential to form 10 flats. November 2012 – Bath Street – plans submitted for change of use from commercial to residential. There were also three other planning applications submitted in Bath Street to change upper floors from commercial to residential use during 2012.